Built in 1959, the former Phil Smart Mercedes Benz dealership at 600 East Pike Street is being transformed into a seven-story building with 285 residential units, 20,000 square feet of retail and 300 underground parking spaces. Bellevue-based developer AvalonBay made use of the city’s zoning incentive program before it was amended, preserving the façade so as to be able to go big. They look like decaying movie sets left over from some long-ago shoot. 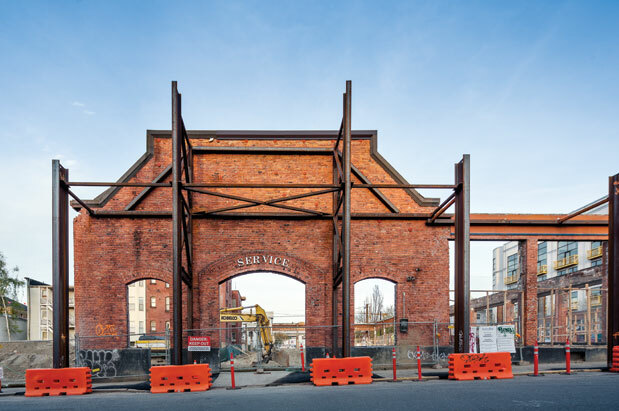 Across Capitol Hill, skeletal remnants of vintage brick buildings are propped up with girders and posts, while huge construction pits gape just behind. The prevalence of these haunting façades is the result of zoning incentives established by the Seattle City Council in 2009 as part of the Pike/Pine Conservation Overlay District, which set out to preserve the character of the old “auto-row” architecture in the neighborhood. Developers were allowed to construct taller buildings provided they retained “character structures” from the buildings they were tearing down. But during the recent boom, some developers took liberties with the legislation, leaving only bare traces of character so as to build higher, wider and bulkier structures—and thereby maximize their return. In June, the City Council amended the guidelines to address out-of-scale development, requiring new construction projects to retain all character elements (either partially or fully) in order to reap building incentives. But for now, it’s all a façade.